Dark chocolate and orange are meant to be together. Throw in buttered brioche, homemade custard and vanilla ice-cream and you have stumbled upon all sorts of wonderful. 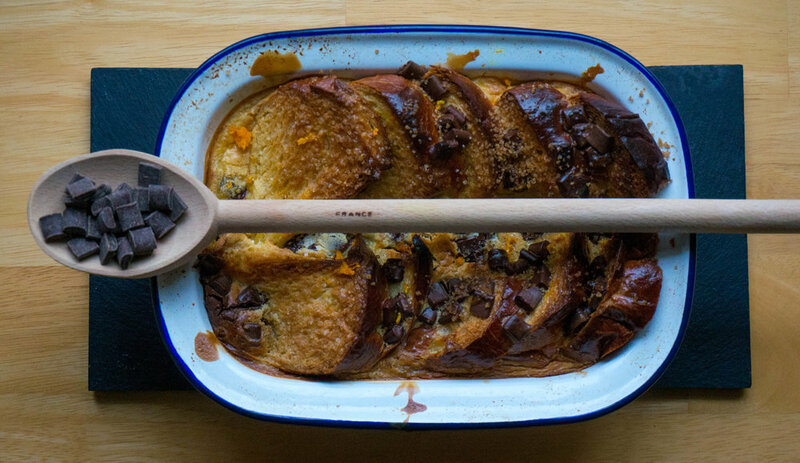 Plain bread and butter pudding has never been my thing. Pudding should be more than the left-over lunchtime staples jazzed up with some custard and brown sugar. I always felt like the dessert was a bit of a trick, one that my five-year-old already chocolate-obsessed palate turned its nose up to. Recently stirred on by cold, misty nights in Rye, and my father’s incessant insistence that I was missing one of life’s best pleasures, I went in search of a recipe to tempt me. This one has since featured three times since Christmas (January diets are just that - for January), has dazzled at a dinner party and may have also been eaten for breakfast. It is so easy to make, and I promise it will impress even the most stubborn of pudding connoisseurs. A few things I have learnt along the way...always keep an eye on the custard as it can scorch quickly. I found that the pudding cooks nicely (and quickly) in a shallow dish with just one layer of bread and custard bubbling away. I often have two shallow dishes going rather than one large pud. Finally, have some spare chocolate chips for serving. And for eating along the way, of course. 1. Preheat the oven to 180C. Grease 2 x 16cm Falcon Ware trays. 2. Whisk the egg yolks with the demerara sugar and salt in a bowl until pale and fluffy. 3. Place the milk, cream, vanilla pod, vanilla seeds and orange zest into a heavy-based pan and bring to the boil. Immediately take off the heat, then set aside for a few minutes for the flavours to infuse. Discard the vanilla pod. 4. Slowly pour the warm milk and cream mixture into the egg yolks and sugar, whisking continuously, until smooth and well combined. 5. Butter the brioche slices and cut in half. Due to the trays we used, we layered ours upright, loosely packed in together. Sprinkle through with dark chocolate drops, and fill tray with custard. Sprinkle some extra demerara sugar over the top of the pudding. 6. Bake for 25-30 minutes, or until the pudding is golden-brown and set. Serve hot. Best served with vanilla ice-cream or thick vanilla custard in my books.